What Organic Produce Does Costco Sell? There is no doubt that the organic trend is here to stay. More and more people are striving to buy only organic. Yet there is still a lot of people that don’t buy organic because they simply cannot afford it or they don’t want to pay the increased cost. Time magazine recently reported that a lot of consumers believe that organic labels are just an excuse to charge more. Clearly cost is clearly an issue when it comes to shopping for organic, that brings me to the topic of today’s post – if you are a Costco member, can this membership make organic produce more affordable for you? During my April 2015 visit to Costco, I recorded what kind of organic produce they had and the prices of that. 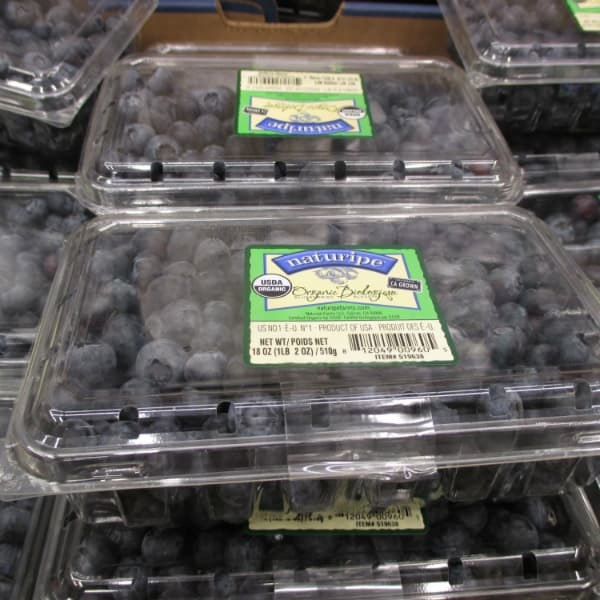 Kept in mind, produce price vary a lot based on season, particularly something like berries. Some of the organic containers of berries at Costco are larger sizes than your normally find. The blackberries came in a 12 oz clamshell where most stores sell the 6 oz clamshell. 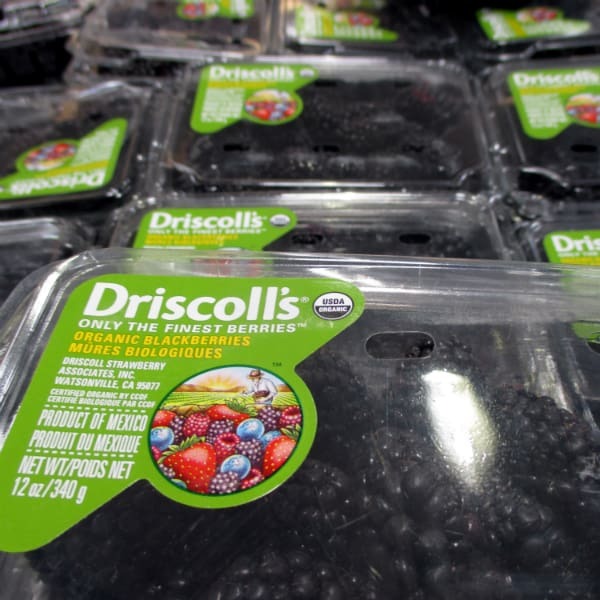 Costco had the usual Driscoll’s berries. You can tell whether they are organic just by looking at the color of the label, a green label means organic, and a yellow label means conventional. Simple! They also had berries from Naturipe. The prices of blueberries is one that wildly changes. Going into summer, expect lower prices, going into the winter, expect higher prices and small containers. 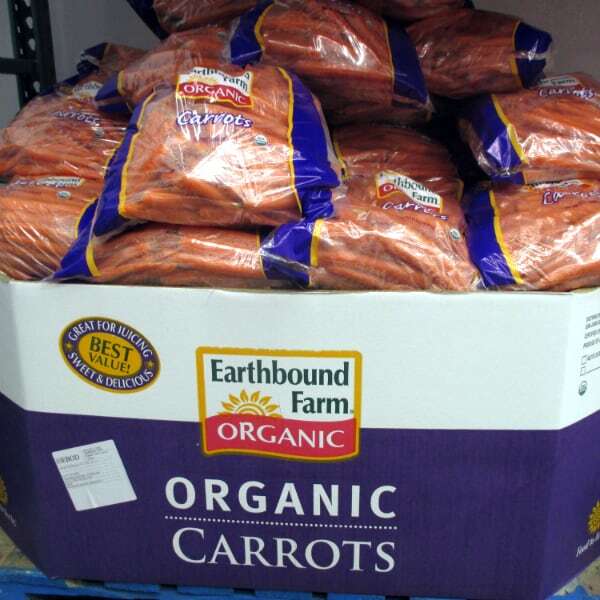 Costco also sells products from Earthbound Farms, a huge organic operation out of Central California. Their stuff is everywhere. Costco sells 10 pounds bags of carrots that would be great for juicing for the low price of 70 cents per pound. 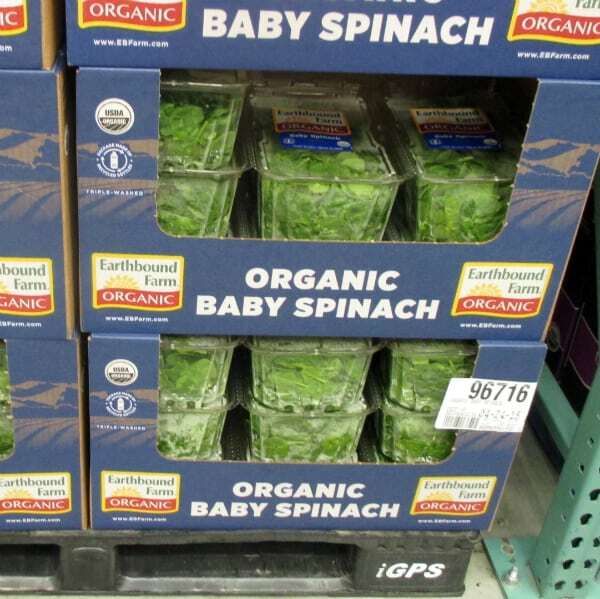 They also have the 1 pound clamshells of organic baby spinach. One thing they had that I haven’t seen elsewhere is the 1.5 pound bags of Power Greens, which is a combination of baby kale, baby swiss chard, and baby spinach – one of my favorite salad mixes and at what works out to $3.66 a pound, it is also the cheapest I have seen this mix going for. It’s excellent for salads – also for juicing or on a pizza for a healthier dinner. How Does the Price of Organic Produce at Costco Compare to Whole Foods? Whenever we talk organic, we just have to bring up Whole Foods Market. They played a huge roll in bringing the organic movement to the forefront and they offer more varieties of organic produce that anyone else (keep in mind NOT all of Whole Foods produce is organic!) Their selection will beat Costco every time. You can get a lot of basic produce items at Costco and the prices are cheaper. For example, organic bananas at Whole Foods cost $.99/lb where they are $.66/lb at Costco or Earthbound Farms 1 pound salads are $5.99 at Whole Foods and $4.49 at Costco. But I didn’t find organic beets, leeks, onions, celery, swiss chard, sweet potatoes, etc. If you are an organic shopper take advantage of Costco’s savings while taking advantage of the Whole Foods selection. Previous Post: « What are Kiwi Berries or Baby Kiwi? I found Driscoll’s Raspberries in Publix grocery store in Summerville SC. They are so good! I haven’t ever heard of them so decided to try them. Too good! Glad you found something you liked. Thanks for leaving a comment.